Easy and inexpensive solution for guarding against trips and falls. Quick installation with easy slit backing - no need to separate connections or dismantle plugs. Double sided tape backing to adhere to carpets or hard floors. Enables you to comply with Health and Safety at Work Act 1974 and EC Council Directive 89/391/ECC. Simply slide a sharp edge over the guide line to enable you to slot in the cable. Most work places will have similar trip risks involving cables, whether they're from a computer or machinery, there are often cables running along floors so it is highly important to cover any loose running cables safely to avoid someone tripping over them. 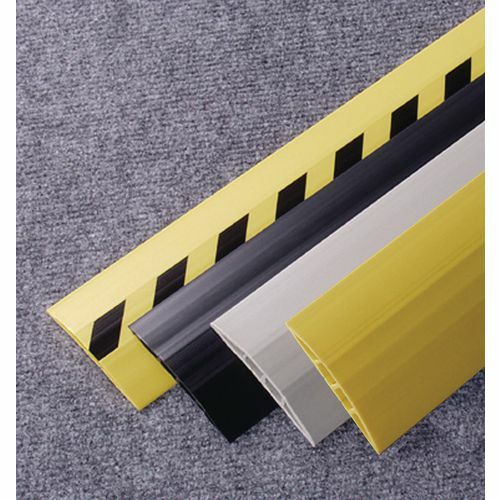 Our rigid PVC cable protectors will provide you with an easy and inexpensive solution to guard yourself and employees against trips and falls caused by cables. They have double sided tape on the back to adhere to carpets and hard floors; they're also quick and easy to install with a slit backing, so there is no need to separate or dismantle plugs. To open the back and insert the cables slide a sharp edge over the guide line which will enable you to slot in the cable. These cable protectors enable you to comply with Health and Safety at Work Act 1974 and EC Council Directive 89/391/ECC. Our rigid PVC cable protectors are available in a choice of four colours; black, black/yellow, grey or yellow and a choice of two widths; 75mm or 100mm. They are provided in 3m lengths and come with a 12 month guarantee and FREE UK Delivery.